It seems that yellow curtains are very difficult to find. I looked at so many stores trying to find some, but had no luck. Everything was pink, blue, or green. Since we can't really paint in our appartment, curtains are how I plan to bring in lots of color. Anyways, I was stuck having to make my own...well kind of. 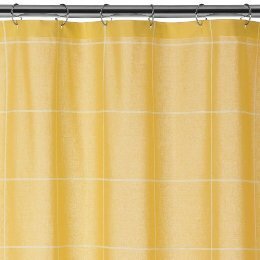 I did find a yellow shower curtain and by cutting in half, doing some heming, and added some ribbon at the top, I've now made some simple curtains. I do have some more planed for them so they are not so boring and more baby like. They also are a little thin so I'll have to back them or something. When I"m done I'll post a picture of them up. It's not the worlds best picture, but it is one that I had on my computer. It doesn't even show the top...I guess I'll have to take a better picture.